Learn how to overcome natural disasters, client problems, PR pitfalls and hacks. When they strike, they can slash revenues, threaten your livelihood and even shutter your small business—especially if you haven’t taken the proper steps to prepare. If you had advance warning that a Category 5 hurricane, cyberattack, public relations nightmare or major client crisis was on the horizon, wouldn’t you immediately immerse yourself in contingency planning and preparation? Consider this your advance warning: More than a quarter of small business owners will experience a significant crisis in any given year, according to a KPMG Risk Advisory Services survey. What’s worse: According to the Ad Council, roughly two-thirds of businesses don’t have an emergency plan in place. Up to 40 percent of business owners who experience a disaster never open their doors again, according to the Insurance Information Institute. But that doesn’t have to be you. With proper crisis preparation and execution of your plan when disaster strikes, your business can survive. Here, MyBusiness offers tips for preparing for—and overcoming—four common crises. Living in Hurricane Alley, Carl Bourgeois, of NFIB-member business Al Bourgeois Plumbing & Heating in Jefferson Parish, La., is no stranger to weathering monster storms. But in 2005, Bourgeois’ business squared off with Hurricane Katrina, which shut down his business for two weeks, cost him an estimated $40,000 to $50,000 in lost revenues, flooded his warehouse in two feet of water and displaced his business for six months. Meanwhile, 350 miles away, Eric Donaldson, another NFIB member, watched TV footage of the damage Katrina was causing and realized he needed to prepare his own small business, Hot Shot Delivery, a same-day delivery company in Houston, for a potential hurricane. It was a good thing he did, because three years later, Hurricane Ike struck Texas. “It was a major wind event,” Donaldson says. “Loss of trees, power. The city itself was without power for two weeks.” Like Bourgeois, Donaldson also lost revenue and had business stoppages despite his preparations. To help your business survive a natural disaster, it’s important to think through every possible scenario. For instance, before hurricanes strike, with several days’ notice, Bourgeois removes both of his business’ primary computers from their offices and transports them to his backup location. Bourgeois also backs up all vital information offsite using MozyPro, a remote backup service. He collects employees’ contact information and the contact information of the family or friends whom they stay with when they must evacuate. Bourgeois keeps this information in a kit that’s always in his car, along with a permit from the city to operate a vehicle during a state of emergency. When Ike struck Houston, Donaldson began to execute his self-developed disaster plan, a short document with instructions for dealing with a hurricane. He dismissed employees a day before the storm struck. He boarded up his office’s windows, deployed a stock of generators he had stored and announced on his WordPress site that the company’s regular phone lines would be down. He also activated a duplicate phone system (half of the company’s orders for deliveries come via phone). Donaldson kept pallets of water, diesel and gas in a warehouse to keep his delivery drivers going, though he didn’t need to use them in this case. In early 2012, Aaron Lee’s 15-employee, Miami Lakes, Fla.-based boutique marketing company, Illuminati Studios, received the news. Its largest client, an international furniture manufacturer in the middle of a strategy shift, was restructuring its management team. As a result, Illuminati’s revenues from the client would decline to roughly 10 percent. If the client had been only a small portion of Illuminati’s business, it might have been a speed bump. But the furniture manufacturer, a three-year-old client, constituted 50 percent of Illuminati’s revenues by 2011. Illuminati managed the manufacturer’s entire marketing portfolio, from print to video. During the following weeks, Lee toyed with the idea of shutting down his company and getting a steady day job. But family, friends and his professional network encouraged him to persevere. When you lose a major client, Lee says, it’s important to take a step back and remember why you opened your business in the first place. For Lee, owning his company was about being the captain of his own destiny. His family and employees still expressed their support for him and that vision. Lee strategically put together a plan to replenish the lost revenue. He leveraged his past performance and good relationship with his bank to obtain a line of credit to cover payroll. Next, he explained his predicament to employees, asking them to take a pay cut. After reducing payroll by 20 percent, Lee and his team made a full-court press to diversify their client base, backfilling much of the company’s lost revenue through new clients. Nearly two years later, the company is still in business. It finished 2012 with revenues that were 25 percent behind projection—a far cry from closing shop. Mighty Muffler, an auto repair shop in suburban Atlanta, had a problem that simmered into a crisis. A 20-year-old customer had come to get his oil changed but was told his vehicle needed repairs. He agreed to the repairs, the mechanics made them, and he paid his bill. Later, his father became frustrated at the cost of the repairs. Although the bill his son paid wasn’t outlandish compared to rates at other nearby shops, the father told the story to a local TV station, saying his son had a learning disability and claiming the shop overcharged for the repair work. The father also took to social media, telling Facebook friends that the shop ripped people off. Finally, a reporter bit on the story, deciding to investigate. When you face a PR crisis, it sometimes makes sense to retain a professional crisis manager to guide you through the process—just as you would want an accountant by your side if you were being audited or a lawyer if you were being sued. Typically, a crisis manager can cost anywhere from $2,000 to $6,000 if the issue is limited and local in scope—a customer complaint, for instance. If the crisis includes a fatality or receives national media attention, prices can jump to $15,000 or more. The Atlanta muffler shop’s owner called a crisis manager, David Johnson, CEO of Strategic Vision, a PR firm in Suwanee, Ga. Johnson and a small team visited the muffler shop and prepped them for interaction with the reporter. They readied the document that the customer signed, in which he agreed to pay for the services. They selected an area outside the shop that would make for a good on-camera interview setting. They coached the owner through potential questions. During the process, the crisis team also discovered that the son had called his father before getting the repairs, explaining how much they would cost. And the team had the muffler shop enlist faithful, satisfied customers to tell their side of the story to reporters and respond to negative social media comments. The story ran on the news, but it reflected as favorably as possible on the muffler shop, Johnson says. David Perdew’s marketing education company, Novice to Advanced Marketing System, in Eva, Ala., has two major revenue-generating conferences each year, where up to 500 people gather to learn the ins and outs of running a business in the digital age. The seven-year-old company, which employs Perdew, his wife and 10 contractors around the world, sees annual revenues of $500,000 to $700,000, primarily from fees paid by approximately 5,000 customers who become members of Perdew’s site, MyNAMS.com. Mortified, Perdew quickly enlisted his website security consultant, who attends each conference, to investigate. Within an hour, they replaced the home page with a landing page for the company, containing basic contact information. Next, they began to look for the hacker online, eventually finding his Facebook page. That same day, they discovered the hacker was a Jordanian member of an organized group called the Islamic Resistance. He had become a member of Perdew’s site and gained access to the database. Perdew reported the hacking to authorities that same day, including the Department of Homeland Security and the FBI. Next, Perdew went to the podium and, on the verge of tears, explained what had happened to attendees, assuring them their information was safe (he knew this because his security consultant checked the integrity of their information first, he says). Over the next six weeks, Perdew shut the site down as his consultant searched each file and rebuilt the site. To err on the side of caution, Perdew would not accept customer card payments for 23 days. In the process, he lost about $75,000 in beefing up the site’s security, changing servers, paying a security contractor and forgoing customer payments. But because of his transparency with customers, he lost only 15 customers six weeks into the crisis—partly, he says, because he wooed them with discounts to stick around. In summer 2013, Jordanian authorities arrested the hacker who had infiltrated his site. Perdew’s advice to other small business owners? Never use a password you can remember. He now uses LastPass.com, an online service that manages his login information at an offsite location and generates passwords that are random and impossible to guess. He says small business owners are a major target for foreign cyberterrorists. The cybersecurity firm Symantec found that businesses with fewer than 250 employees sustained 31 percent of all cyberattacks in 2012, up from 18 percent in 2011. 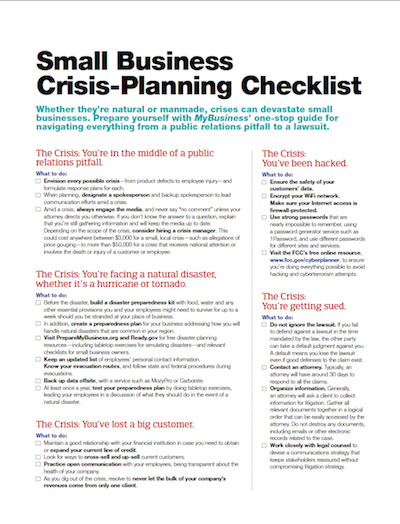 Click here to download our crisis-planning checklist.